We have the best kadults. No, seriously - we do. 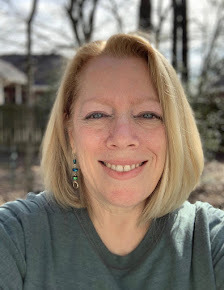 They still like us and want to spend time with us, and are very generous with their money, which is how we ended up going on a family vacation to Orlando, Florida last week. 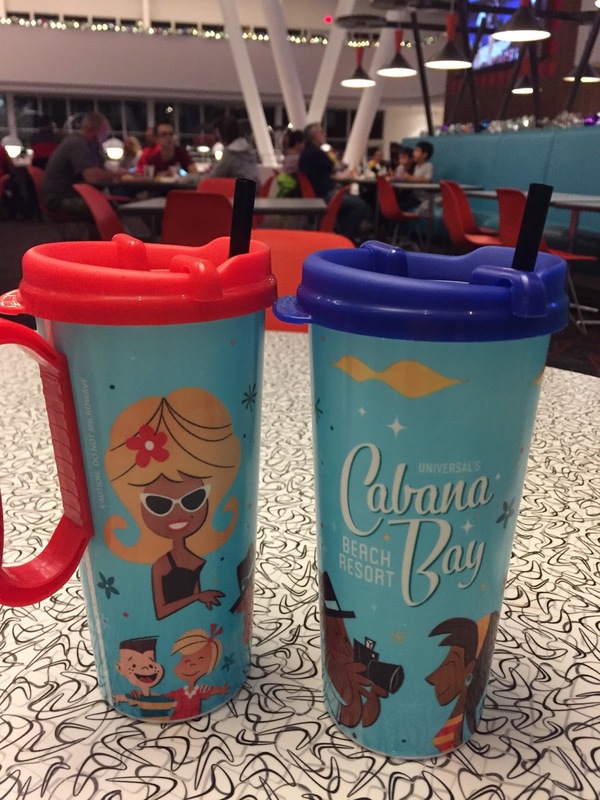 Sam and Allie decided that this would be our gifts for the year (birthdays, mother's and father's day, and Christmas), and with that, they booked a stay at the Cabana Bay Beach Resort in Orlando and purchased tickets for Universal Studios, along with Disney World! We were all set to drive to Orlando on the Saturday after Thanksgiving, when Sam found super cheap airline tickets about a week before, so we all ended up flying there. I have to say, the thought of driving for two days there, and two days back wasn't something I was looking forward to, and considering the cost of a rental car, fuel, parking at the hotel and at Disney, I think we came out ahead, even with paying for the airport shuttle to the hotel (we used Uber to get to Disney). We flew out of D/FW airport, and hit the only snag of the trip there - our flight was delayed for several hours. 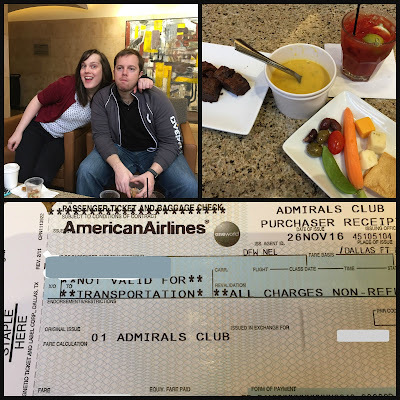 We were ready to settle in and wait with the other passengers, but Sam decided we needed to hang out in the Admiral's Club and boy was that nice! It's expensive, and not something we'd probably ever do on our own, so this was a fun experience and we made the most of it - about the only thing we didn't do was shower there - but we could have! 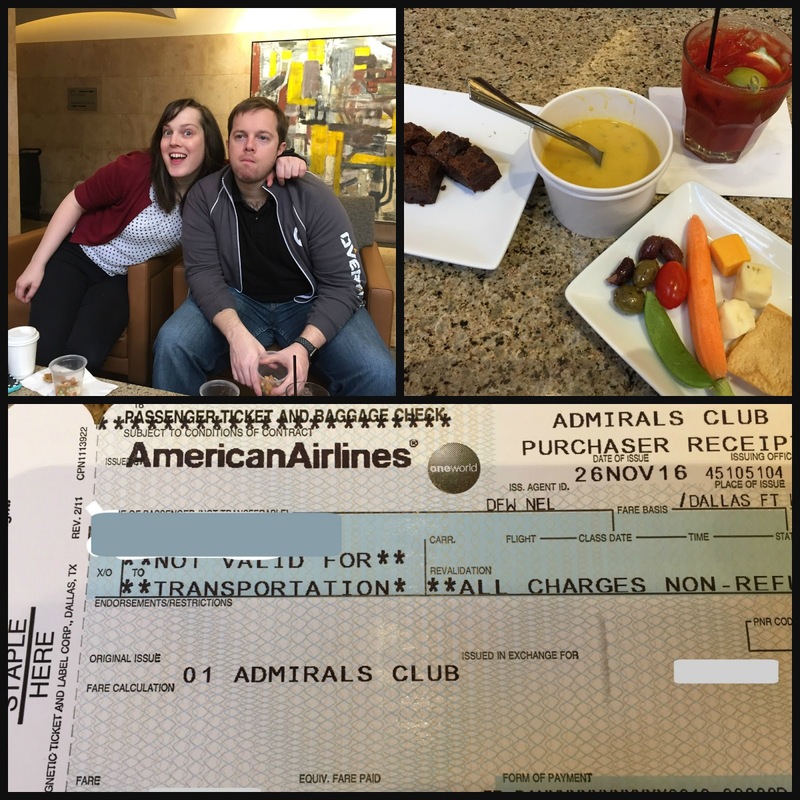 Free drinks (including alcohol), snacks, soup, dessert - we tried everything! This sign was so pretty at night! We finally got on our way and arrived in Orlando in the evening. We took a shuttle to the hotel, and what a fun hotel it was! 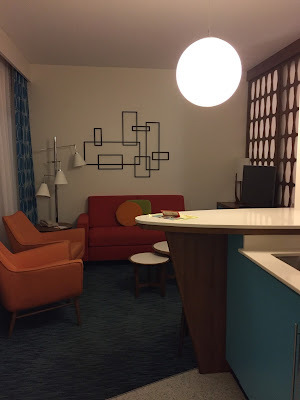 The Cabana Bay beach resort is a throwback to the 1960s era in design and it felt very familiar to Jeff and I. It's only been open for a couple of years so it's still super clean and sparkling. We had two regular rooms booked, but when we checked in, the staff upgraded us to family suites at no extra charge; our rooms were right next to each other and we even had an inside door between the rooms so we could go back and forth without having to go outside. Our sitting area - the couch is a sleeper sofa. And I can attest that it worked great for some power naps! View from the adjoining doorway - a little bit of the kitchenette is showing. There was a nice sized refrigerator, a microwave, and a coffee maker included. Bedroom - plenty of space to spread out. Bathroom - shower and sink on one side, then another sink, then a third room with the toilet. This was nice - we didn't feel like we were constantly bumping into each other while we were getting ready. OK, I have to admit, this really charmed me - they went old school with the soap and shampoo, and I loved it. 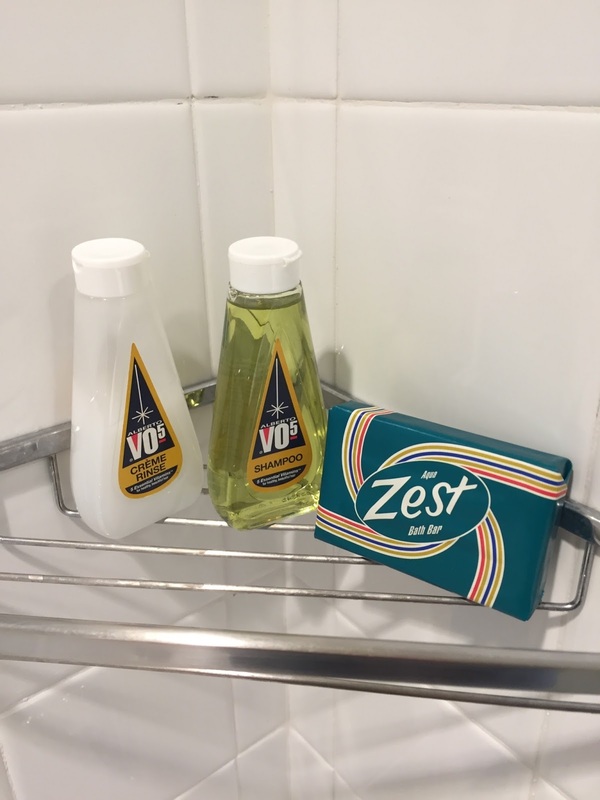 I also had the Zest jingle going through my head the entire week ("You're not fully clean unless you're ZESTfully clean! ")(you're welcome for that, haha). Our rooms were in the Starlight wing. The resort has two pools, complete with a waterslide and a lazy river, a hot tub, beach lounges in sand, and of course an outdoor bar for your beverage needs. Jeff and the kadults went swimming several times but I only used the hot tub, and boy did that feel good on my tired feet and legs! 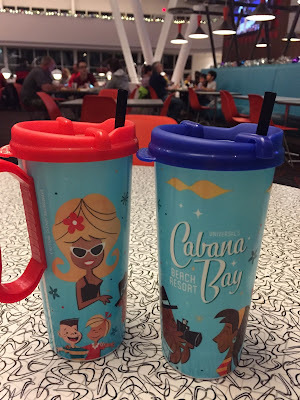 We got our money's worth with these cups! Loved the retro design of the Galaxy Bowl! I also played this game - my first shot went over the machine! Oops. I wish I could have parked my Mini next to the blue car for a size comparison - these cars were huge! They also played old-school Christmas music, along with regular old-school music. Except for the hotel in Maui, we've never stayed at a resort like this, where everyone there is on vacation. It was super relaxing and a great immersive experience - we never turned on the TV, and thanks to the poor signal strength from Sprint, we mostly stayed off the internet, which meant we got to forget/ignore what was happening in the rest of the world for a little while. This was a great place for a vacation and I highly recommend it, if you're planning a trip to Orlando! Next up - walking, walking, walking. And also the theme parks! Stay tuned! Wow what a great gift from the kadults and what a great vacation the 4 of you had. Love how the resorts looks, looks like such a fun place to stay at. And great that you could fly over there. The thought of sitting in a car for 2 days is reason for me not to go. We used to drive to Italy back in the days but since flying is so much cheaper we do that and rent a car. Knowing now how tired we were, I'm really glad we didn't have to spend two days driving home. That would have been ROUGH. O wow, how did I not now that you were going to Orlando? can't wait to hear about the days at the parks! You'll be hearing lots, I promise! Travel is the best gift 🎁 what a fun trip! Aren't you lucky to have such wonderful kiddos!! We spent Thanksgiving week at Disney World with the kids and my husband's whole family! It was soooo busy there but a whole lot of fun! So much FUN!!! What a great present(s), too. Wowza! That resort really is something! i love the cup with the chip in it! And for some reason I presumed that this was a trip to Harry Potter World. It will be fun to get your take on these other parks! I'm so glad you got to fly there. I'm just going to L.A. in January, and I decided to fly instead of drive because its one whole BORING day of driving! Hurry up, Wednesday! I want to hear more! Wow, how fun is that resort? I'm all about retro. But since they are bring back the 60s and 70s, does that mean we are getting old? Fun, fun, fun! And what, to me, sounds like a quite active vacation. Which I suppose means that WWU is going to be all about the mileage you put in getting around those parks. You know, my favorite vacations are the ones where I really unplug from all the internet and social media stuff! Ooh, I can't wait to hear more! I've got a trip coming up with my boys, but we're only doing Universal Studios. I love that you all did this together - what a great gift for the year! And the retro throwbacks are awesome! Isn't it also awesome when your cell signal doesn't work and you totally chill! Ahh.